Several top experts, including several former heads of state, gathered at TAU on May 19 to inaugurate a new institute established to broach international problems from a multidisciplinary perspective. The Boris Mints Institute for Strategic Policy Solutions to Global Challenges will draw on TAU's diverse and multidisciplinary academic units to tackle issues such as food security, renewable energy, water, economics, labor studies, conflict resolution, and other critical fields with the goal of formulating strategic policy recommendations to decision-makers worldwide. At the inauguration, Dr. Mints, a businessman from Russia who holds a PhD in engineering, explained that he established the institute in Israel because it is the birthplace of our civilization and thus there is no better place to study the most pressing concerns facing our civilization today. Furthermore, he cited Israelis' full independence from political influence in studying international issues. Mints received an Honorary Fellowship from TAU at this year's Board of Governors Meeting. Photo: Dr. Boris Mints speaks at the inauguration. Institute Director Prof. Itai Sened, said the Institute's interdisciplinary nature bestows him and his colleagues with flexibility to "navigate through a complex network of universities and structures. They key to our success is the remarkable opportunity to work in a way that connects four faculties and dozens of researchers." Additionally, he said, "Every research project is connected to a project on the ground." The inauguration ceremony was followed by a symposium highlighting two key issues the Institute will address: energy and refugees. 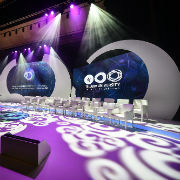 Among the foreign dignitaries and speakers present were Prof. Armen Darbinian, Rector of Russian-Armenian State University and former Prime Minister of Armenia; Prof. Václav Klaus, Co- Founder of the Václav Klaus Institute, former President of the Czech Republic; and Dr. Simion Djankov, Rector of the New Economic School in Moscow and former Deputy Prime Minister and Minister of Finance of Bulgaria.